Like tens of thousands of Christians from Bethlehem, Nazareth and smaller towns in the Galilee, the Nassers have fled the land where Jesus was born and raised and where he preached. BETHLEHEM, West Bankâ€”Hanna Nasser, the congenial, goateed mayor of Bethlehem, keeps a family tree that tells the 400-year-old story of his ancestors, all Christians, all residents of the Holy Land. It is a proud lineage, and Nasser, relaxing in his office on Manger Square, describes it proudly. But when future generations of Nassers try to piece together their own tree, the branches are bound to get tangled, and some may disappear altogether. Nasser’s brother has moved to El Salvador. His first cousins live in Montreal and New York. One aunt has made her life in Colombia. Second cousins are in Venezuela, more distant relatives in Haiti and California. Like tens of thousands of Christians from Bethlehem, Nazareth and smaller towns in the Galilee, the Nassers have fled the land where Jesus was born and raised and where he preached. They have opened sweets shops in Santiago, Chile, trading companies in Port-au-Prince, Haiti, and grocery stores from New York to Detroit to Los Angeles and Sydney. Pope John Paul II, who is scheduled to come to the Holy Land next week on a Jubilee Year pilgrimage, will find that Christians have abandoned the territory that now makes up Israel and the West Bank in such numbers that some smaller denominations–Armenian and Syrian Orthodox, for instance–wonder aloud whether, after so many centuries, Christians will dwindle to insignificance in the next generation or two. Even among the larger Christian communities, such as Roman Catholics and Greek Orthodox, the anxiety is acute. In Bethlehem, which was almost entirely Christian during World War II, no more than one-third of the 20,000 residents are Christian today. “I’m afraid that in 30 years the Christians of Bethlehem will be very few,” said Nasser. John Paul’s visit is meant partly to raise the morale of Christians here, and to send a message of hope and support to a community with deep roots but a shaky footing. A century of war, upheaval and uncertainty has taken its toll. As Palestinians, they have fared no better since the birth of Israel than the much larger community of Muslims. And, analysts here agree, it will take more than a papal shot in the arm to reverse the long-term trends that have contributed to Christians’ extraordinary exodus from the land of their forefathers. Beset by low birth rates and paltry job prospects, Christians here have taken advantage of their contacts, family connections and education to seek better lives abroad. In the past half-century, their numbers have crept up scarcely 25 percent, to 180,000 in Israel and the Palestinian territories, from 145,000 in the British-ruled Palestine of 1948. That suggests some 230,000 Arab Christians have departed since Israel’s birth that year, according to Bernard Sabella, a sociologist at the University of Bethlehem who has studied emigration patterns. Arab Christians today make up no more than 2 percent of Israel and the West Bank. That is a steep drop from a century ago, when Christians were 13 percent of the population of what was then Palestine. According to Sabella, the Christian presence will diminish further in the coming decades, accounting for a fraction of 1 percent by mid-century. * Of the 25 people in Nasser’s high school graduating class at the Freres School, a Catholic institution in Jerusalem, all but four now live overseas. * The average age of Arab Christians, about 32, is nearly twice as high as that of Palestinians generally, about 17. * In Jerusalem, more than 60 churches serve a community that numbers no more than 10,000 Christians–one church for every 150 believers. * The Syrian Orthodox church in Jerusalem’s Old City, St. Mark’s, performed more than 50 baptisms each month before 1949, parishioners say. Today the church, whose Sunday liturgy is still held in Aramaic, the language of Jesus, baptizes no more than 20 babies in an entire year. Before 1948, Bethlehem, Nazareth and other towns in Palestine were heavily Christian. A varied and relatively prosperous community of Arab Catholics, Protestants, Greek Orthodox and others, their roots extended in some cases to the time of Jesus, and in others to the Crusaders of the Middle Ages. Disaster struck in 1948 for Arabs throughout Palestine, Christians as well as Muslims. More than a third of the Christians living in present-day Israel fled or were forced from their homes during and after the war. In the ensuing decades of political turmoil, Arab-Israeli conflict and economic struggle took a harsh toll. Despite occasional grumbling, there have been only rare instances of repression or discrimination directed against Christians by Israel or the six-year-old Palestinian Authority of Yasser Arafat. In general, Christians are treated no better and no worse than their Muslim neighbors by their respective governments. In territories administered by the Palestinian Authority, where 50,000 Christians live, a draft constitution names Islam as the official religion. But the reality is benign: Arafat’s wife, Suha, is a Christian. So is the chief of his office in Gaza City, Ramzi Khoury. 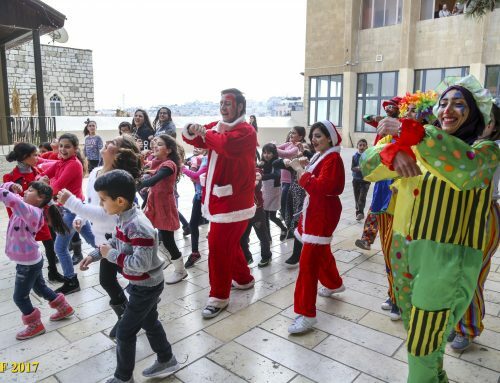 The mayors of several major West Bank towns, including Bethlehem, are Christian. And six of the 80 seats in the Palestinian Legislative Council have been set aside for Christians from Bethlehem, Jerusalem and Ramallah, a representation greater than their numbers. In Bethlehem, the more frequent complaint among Christians–as well as Muslims–is directed at Israel, which blocks access for many Palestinians to nearby Jerusalem and its job market. That is a blow for Bethlehem residents, whose unemployment rate is around 20 percent. “My nephews can’t go to Jerusalem for jobs or anything else,” said Siham Kataan, whose family trading company is one of the biggest and most successful in the West Bank. “Their world is restricted to Bethlehem. . . . What can they do? In Israel, where 130,000 Arab Christians live, there have been more complaints about discrimination. Israel’s decision last year to allow Muslims to build a mosque alongside the Basilica of the Annunciation in Nazareth particularly incensed many Christians, who saw it as pandering before national elections. Still, the general situation of Christian Arabs in Israel is not appreciably different from that of Muslims. Both are barred from a wide variety of public and private sector jobs in Israel, and both suffer from a range of economic and social ills.